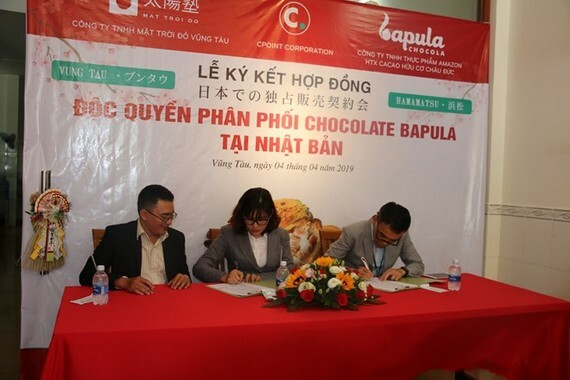 Vietnam’s Amazon Foods Co., Ltd., and Vung Tau Red Sun Co., Ltd., have signed an exclusive contract with Japan’s Cpoint Corporation to distribute organic Bapula chocolate products in Japan. 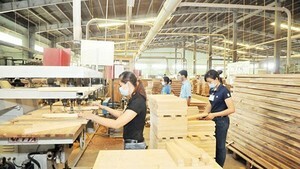 The signing ceremony took place in Vung Tau city in the southern province of Ba Ria-Vung Tau on April 4. Ho Si Bao, Director of Amazon Foods and member of the Chau Duc organic cacao cooperative in Ba Ria-Vung Tau, said the company will export 1,000 organic chocolate bars to Japan in April this year. This is the first mark of locally-made chocolate to be exclusively distributed in Japan, he said. To stabilise the source of chocolate production material, Amazon and Cpoint signed a deal on planting organic cocoa trees according to Japanese high technology on an area of about 40 ha in Chau Duc district, he added. Cpoint Director Hiroki Nozawa said he and his partners in Japan highly value the quality of Bapula chocolate, which meets the strict criteria of Japanese customers. Therefore, the corporation decided to choose this product for sale on the Japanese market, he added.